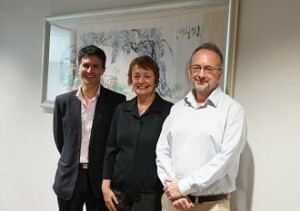 On Thursday, 5 February the Australian Hearing Hub played host to The Hon. Victor Dominello MP, Member for Ryde, Minister for Citizenship and Communities, Minister for Aboriginal Affairs, Minister for Veterans Affairs, and Assistant Minister for Education. He was welcomed by Professor Janet Greeley, Executive Dean, Faculty of Human Science and the Australian Hearing Hub Relationship Manager. The visit began with a tour of the Macquarie University Speech and Hearing Clinic. The clinic is research active, provides an evidence-based clinical service to people of all ages, and high quality clinical education for students enrolled in the Master of Clinical Audiology and Master of Speech Language Pathology programs. The Minister was then given a demonstration of the 41-loudspeaker surround sound system in the anechoic chamber. The visit included a chance to see telepractice in action at the SCIC Cochlear Implant Program, an RIDBC service, where a child was having their cochlear implant programmed remotely. The Minister was able to talk to the cochlear implant client who was physically located in Samoa. The tour concluded with a visit to ARC Centre of Excellence in Cognition and its Disorders, where the Magnetoencephalography (MEG) systems were showcased.